The prevalence of allergy diseases and asthma has increased. 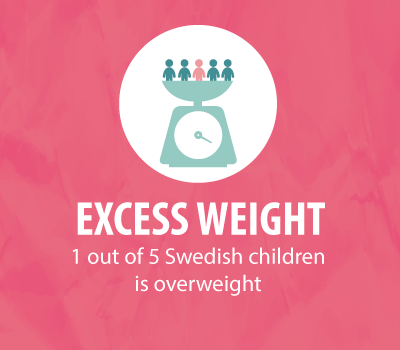 It is estimated that about 1 out of 3 children is affected but we do not know how common it is in Västerbotten today. Allergic reactions can be mild and transient but some people suffer severe reactions. It is not quite clear why allergy illnesses and asthma have become more common but it is thought that changes in our environment and lifestyle have contributed to this increase. One theory is that our modern lifestyle means the body’s immune system is not exposed to bacteria, viruses and other contagious substances that are needed for the immune system to develop normally. The body’s immune system develops in the womb and during childhood and the immune system seems to be particularly sensitive to influences during that period. The immune system has to learn how to defend the body against contagious substances but not react to ordinary substances in our surroundings or in food. In the case of allergy, the body’s immune defence reacts to substances (such as pollen) which we should normally be able to tolerate. 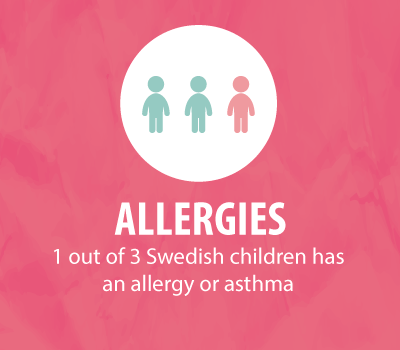 In the Northpop study, we are going to find out how common it is for children in Västerbotten to have allergies and asthma and investigate how lifestyle, environment, pharmaceuticals and eating habits affect the risk of becoming ill. We will also investigate the significance of bacteria, viruses and other contagious substances that are always present in the mouth and bowel. Our goal is to find new ways of preventing allergies and asthma. Obesity is a chronic disease and one of the major public health problems. For several decades, we have seen a continually increasing prevalence of obesity and excess weight in society, among children and youngsters too, but this increase appears to have stopped now. Among 4-year-olds, 2-3% are obese while about 15% are overweight. There are many factors behind this; some are hereditary while others are linked to environment and the interplay between them has not been fully established. We know that rapid growth during the early years increases the risk. Diet and probably the composition of the intestinal flora are of significance, as are physical exercise, inflammation and perhaps infections. It is important to map and understand mechanisms and links between different contributing factors so that we can draw up effective preventive strategies to counteract obesity/excess weight and promote health in a lifelong perspective. 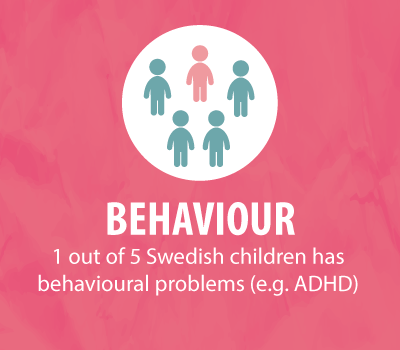 About 20% of all children are afflicted by learning problems and behavioural problems including ADHD, autism spectrum disorders, specific learning problems and general slow development. The causes of these problems have not been fully established but it is a combination of genetic, environmental and psychosocial factors. It would therefore be very valuable to be able to identify risk and health factors, including diet, lifestyle and environmental toxins that can affect the risk of children having learning and behavioural problems. It is already known that certain factors, such as breastfeeding, have a positive effect on a child’s development while other factors such as the mother drinking alcohol during pregnancy have a negative effect. Through our research, we have recently shown that simple measures such as the late clamping of the umbilical cord, giving extra iron and energy to babies with a low birth weight, and adding fat to infant formula can improve children’s development and reduce behavioural problems. In the Northpop study, we want to identify more factors that can affect the development of the brain in the womb and during early childhood. The brain is the body organ that grows the fastest during this period of life. Some interesting factors that we want to investigate are exposure to environmental toxins and certain nutritional deficiencies that may be more common that we have previously thought (Vitamin D deficiency and iodine deficiency). För provinsamling och förvaring av provmaterial är Västerbottens läns landsting huvudman och personuppgiftsansvarig.